African borders have long been artificial obstacles to trade for policymakers, imposing unnecessary burden on the circulation of goods and people, and slowing progress toward regional integration. While borders remain difficult to cross in many parts of Africa, they also provide business opportunities to many long-distance traders, who manage to bridge nationally organized markets. Without such traders, West African maize, Nigerian cement or Chinese textile wouldn’t stimulate the food economy, support the urbanization process and respond to the needs of the emerging middle-class. Despite their crucial contribution to regional integration, trade networks have rarely—if ever—been mapped, formally described, and modelled. In such a dynamic business environment as West Africa, traders rely on their social networks to carry out their business, but the precise patterns of such networks remain largely unknown. At the same time, most formal network science has thus far largely ignored Africa, despite Clyde Mitchell’s advocacy for an analytical rather than metaphorical approach to networks in African studies. Our recent paper Business, Brokers, and Borders aims to fill this gap by showing how the social and spatial organization of trade networks in West Africa can be formally modelled. We built on a fast-growing field of research known as Social Network Analysis (SNA) to map how 136 large traders dealing with building materials, cereals, textiles, and used clothes are connected across borders. Our study focuses on five markets located in Nigeria, Niger, and Benin—three countries among which there are intense import and export flows of agricultural and manufacturing products. The study shows that trade networks are rather decentralized, with most traders connected to a limited number of trusted partners. This social structure seems well adapted to a business environment where contracts are not strictly enforced by formal institutions, access to credit is difficult, and information transmission is slow and costly. What makes West African trade networks resilient to the constant variation of volume and directions of business activities is, however, the presence of brokers, a structural term that applies to traders who create business connections beyond their group and link traders that wouldn’t be otherwise connected. 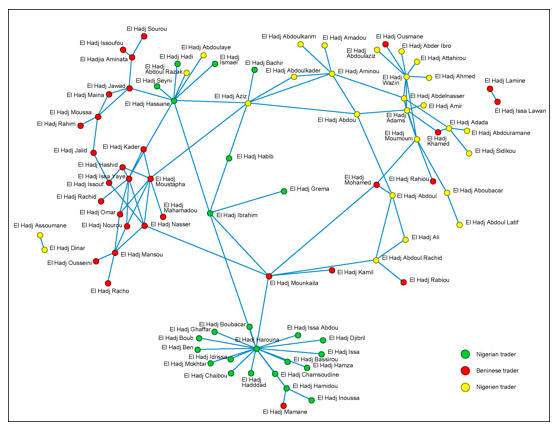 Key brokers occupy the central part of Figure 1, which provides a visualization of the relations between traders from Niger, Nigeria and Benin in the Dendi region. Notice, for example, how El Hadj Mounkaila, El Hadj Ibrahim, or El Hadj Aziz act as bridges among traders from Benin, colored in red on the left-hand side of the graph, traders from Niger represented in yellow, and traders from Nigeria in green. This structural position allows them to play a gatekeeping role in the region. Brokers are particularly important where markets have recently developed due to the liberalization of trade, as opposed to where trade has precolonial roots. In places such as Gaya, Niger, whose population has risen from 8,000 to 45,000 in less than 30 years, most traders rely on a few brokers they trust to import goods from the world market. Having moved to the region since the 1980s because of the new opportunities created by the Nigerian market, large traders haven’t had the time or will to develop long-lasting cross-border ties with numerous partners on both sides of the border. This situation contrasts sharply with the one found in the Hausa region, where almost every trader in Niger has a direct tie to a business partner in Nigeria and vice versa. Our research also confirms that, while strong brokers are needed to develop resilient, transnational trade networks, the most successful traders are those who can simultaneously bridge several markets and be strongly embedded in a cohesive group of close business associates. While brokerage provides access to new information and resources, embeddedness provides trust among peers and reduces the risks of doing business across a region where borders can be closed unexpectedly, bridges can collapse and halt traffic for weeks, and shipments can be confiscated until an informal arrangement is found with customs authorities. Mapping social networks advances our understanding of how West African traders manage to overcome the uncertainties of doing business across the region. It highlights the most prominent players, who is structurally marginalized, and the constraints imposed by the overall network on traders. These insights can be combined with more qualitative studies that capture the social complexity and meaning of social ties as well as the temporal formation of networks. A combined approach to trade networks can also make a significant contribution to the revival of interest for cross-border trade in the policy field. Because embeddedness and brokerage strongly affect the performance of traders, growth, and network-enhancing policies currently developed by international organizations such as the World Bank, the African Development Bank, or the OECD would have a higher impact on trade if they could enhance the positive aspects of intra-community ties in business communities, while supporting the creation of external ties among traders, governments, and aid agencies. Note: Olivier J. Walther is an associate professor in the department of political science at the University of Southern Denmark and visiting professor in the division of global affairs at Rutgers – The State University of New Jersey. He can be reached at ow@sam.sdu.dk. Walther O. 2015. Business, brokers and borders: The structure of West African trade networks. Journal of Development Studies 51(5): 603-620.